10 tracks: Woodlea Mount / The Blue Reel / The Earl’s Chair * Atlantic Forest / Nearly Not / Colonel Penguin * Ardessie * Fleurs de Mandragore / Over The Moors to Maggie * Money, Stories, Fame….Stuff / Boy On a Headland * Osmosis / Alasdair’s Reel / The Grey Coast Reel * Rob of The Strath * Phil & Marina Anderson of Springlands / Limehill / McKinnon’s Brook / Hamish The Carpenter * Shop Street * Wick to Wickham / Anna and Rob Rowe of Plockton / The Black Stairs. Gordon Gunn is one of Scotland’s top fiddlers and a member of the hugely successful Scottish band Session A9. He is also regarded as a talented composer, especially of slow airs which are the envy of all tunesmiths. Born and brought up in Wick, Caithness, Gordon was taught by the highly respected violin teacher Margaret Henderson and was soon involved in different aspects of Scottish music. After recording Shoreside with The Gordon Gunn Band for Greentrax in 2000, Gordon was invited to join top Scottish band Session A9 and also Anam. He continues to gig with The Gordon Gunn Band which these days consists of Brian McAlpine (keyboards) and Phil Anderson (guitar). Gordon is also in demand as a fiddle tutor and has participated in workshops at many major music festivals throughout Scotland. As a session musician he has worked on several albums. 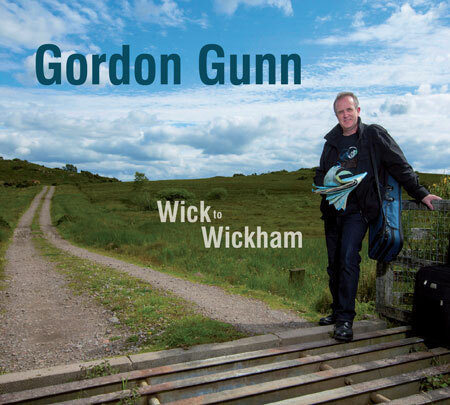 On Wick To Wickham, Gordon has surrounded himself in the studio with not only Brian and Phil but also Marc Clement (guitar), David (‘Chimp’) Robertson (percussion), Tim Edey (melodeon) and Marc Duff (whistles). Together they produce a rich and exciting sound. The sets include several of Gordon’s own compositions, those of other contemporary composers and several traditional tunes. The album was recorded at Storm Sound Studio, Orkney, and mastered at Studio-D Wick. The artwork is by Colin Keddie of K4 Graphics. After an absence of five years, Greentrax is delighted to welcome back Gordon Gunn to the fold and we are proud to release what we believe is an outstanding album.